In 1992 Anthony Boden published Three Choirs. A History of the Festival. That invaluable book took the story of this great English music festival up to the early 1990s: the 1991 Festival was included in the story and Mr Boden looked ahead to the 1992 Festival. Now, with the help of Paul Hedley he has brought the history right up to date in a revised and expanded version that goes up to 2015, the year in which the Three Choirs Festival proudly celebrated its tercentenary. Towards the end of the concluding chapter of the 1992 edition Anthony Boden looked forward to the forthcoming Gloucester Festival of 1992 “in which Three Choirs will celebrate Britain’s full entry into the European Community.” It’s a sad irony that the revised edition of his history should appear as we seek to extricate ourselves from the EU. How times change! The authors are highly qualified for their task. Following a career in the Royal Air Force Anthony Boden served as Administrator of the Gloucester Three Choirs between 1989 and 1999. He has several books on music to his credit and he was the founding Chairman of the Ivor Gurney Society in 1995; since 2015 he has been president of that Society. Paul Hedley combines a career in the world of business management with choral conducting and spent five years (2008-13) as the first Chief Executive of the Three Choirs Festival. You may well have a copy of Mr Boden’s original book but I have no doubt that the new edition includes sufficient differences and enhancements to warrant you making an upgrade. The original volume ran to 260 pages of text plus an appendix. The new one has 432 pages plus a different appendix. The change of appendices is significant. In 1992 there was a substantial appendix, ‘Annals of the Three Choirs’ compiled by Christian Wilson. This listed, inter alia, all significant works performed since 1890. That resource is now to be published online on the Three Choirs Festival website and already the Annals covering the period 1990-2009 are available there. It is intended to add to this resource over time. I’ve found these Annals most useful over the years and it will be good to have the information online where it can be updated periodically. Instead of the Annals the new volume has a valuable Timeline appendix. There are other enhancements. The number of illustrations has been expanded significantly – there are now some 150 black and white pictures. Boden’s original 22 chapters have been retained but what was his final chapter, ‘The House of the Mind’ has been significantly expanded and four new ones added. One presentational difference is that this time the footnotes are at the foot of each relevant page rather than grouped at the end of the chapters; I welcome this. I haven’t made a detailed comparison between the two editions but spot comparisons indicate that much of Boden’s original text has been retained unaltered and that’s good: as they say, ‘if it ain’t broke, don’t fix it’. However, with the benefit of further research undertaken since the original History was published, it’s been possible to expand the account of the early years quite significantly in this latest edition. The authors have an absorbing story to tell and they relate it very well. The book is highly readable and is the product of evidently thorough research. The text is full of quotations from contemporary sources. A slight downside of this is that the reader has to negotiate some pretty orotund eighteenth- and nineteenth century prose but on the other hand through reading the contemporary writers one gets a pronounced flavour of the times. Furthermore, the authors have an eye for a vivid quotation and some of the quotes made me chuckle. Is the Three Choirs the oldest music festival in the world? It’s a bold claim but I for one struggle to think of a festival that has been in continuous existence for longer. It’s not easy precisely to date the inception of the Festival but for some time it’s been generally accepted that the first Meeting of the three cathedral choirs of Gloucester, Hereford and Worcester took place in Gloucester in 1715. (The gatherings were known as Meetings until 1838 when the term Festival was used for the Gloucester assembly.) Since 1715 the gatherings have taken place annually though the festivals were suspended during the two World Wars which occasioned the loss of 13 festivals. Thus it was that the 2015 Festival in Hereford marked the tercentenary but was “only” the 288th festival. In fact, though 1715 is the widely agreed starting point there is quite a bit of evidence, discussed in the book, of earlier collaborations between the cathedrals, dating back as far as 1662. From the early days the festivals were put on in order to raise funds for the support of widows and orphans of clergy in the three dioceses. This was important, not just for the good it did but also because when the institution came under threat of cancellation a few times in the nineteenth century it was the charitable link that saved the day. The direct charitable purpose only came to an end in the late 1950s. One important thing to remember is that though we use the term Three Choirs Festival it is only very recently that the Festival became a unified organisation. Each cathedral in turn put on its own festival, by annual rotation, to which colleagues and friends from the other two cathedrals were cordially invited. Of course, there was cooperation but each city’s festival was independently organised. Even to this day the Director of Music at the host cathedral plans the programme though the collaboration between the three cathedral Directors of Music is close and friendly. It was only in 2008 that the administration of the Festival was unified under a Chief Executive running an administrative structure, gradually expanded, that covered all three venues and which maintained a round-the-year existence. Paul Hedley was appointed to the new role and has the distinction that when he was appointed he became the first-ever salaried employee of Three Choirs. Initially the Meeting of the three cathedral choirs was just that: the choirs got together to sing services. Gradually, over time, the scope widened, concerts were put on and the gatherings extended to three days and eventually were extended further into the now long-established one-week format. Though the repertoire of the Festival very gradually expanded over time it’s easy to see why the institution came to be labelled musically conservative by a good number of commentators. In 1757 Handel’s Messiah was first heard at the Gloucester Meeting and with two exceptions the work was then given in whole or in part – usually the former – at every single festival until 1963. Messiah later had a “stablemate”: Gloucester was again the venue for the first Three Choirs performance of Mendelssohn’s Elijah in 1847 and, once heard by the Festival audience, it became a second hardy perennial of the programmes until 1929. To their credit, the authors don’t duck this issue of conservatism. However, they very fairly point out that there were practical and financial justifications for this safety-first approach. On the other side of the coin, however, the book shows convincingly that the Festival conductors did introduce their audiences to quite a lot of new and unfamiliar music. Though quite a lot of this was music by Victorian composers that has deservedly sunk without trace Three Choirs gave early exposure to a number of notable works. One such example will suffice: in 1884 Worcester played host to what was only the second English performance of Dvořák’s Stabat Mater – and with the composer himself on the rostrum. One aspect which is covered carefully, and which may surprise some readers, is the frequent tensions between the Festival and the clergy. Sometimes this was simply a question of taste – in the nineteenth century especially, several bishops and senior clergy were averse to music and so absented themselves during festival weeks. But there were doctrinal tensions too. Although the first Three Choirs performance of The Dream of Gerontius took place in 1902 (at Worcester) this was only after quite a lot of delicate negotiation over certain Roman Catholic aspects of Newman’s text. The Dean of Gloucester took much more convincing and a full performance of Gerontius wasn’t permitted in his cathedral until 1910. Other works fared even worse: Walton’s Belshazzar’s Feast wasn’t considered suitable until 1957. Happily, relations between the Festival and the clergy are much more harmonious and collaborative nowadays. If Messiah and Elijah dominated the Festival throughout the nineteenth century (and earlier in the case of Handel’s oratorio) the figure who towered over proceedings in the twentieth century was Sir Edward Elgar; as we read, his music was “lionised” at Three Choirs. The authors do full justice to the relationship between Elgar and the Festival. They are equally good in chronicling the strong bonds with composers such as Parry, Vaughan Williams, Howells and Finzi. Anthony Boden and Paul Hedley record in lively detail the contributions of the various Organists at each of the three cathedrals. Some, from the early days, made no significant contribution but others were major figures. During the twentieth century, each cathedral benefitted from the leadership of some outstanding musicians – and the link with Three Choirs must have been a strong draw, encouraging talented musicians to apply for the Organists’ posts. Gloucester had Sir Herbert Brewer (in post 1897-1928) followed by Herbert Sumsion (1928-1967) and John Sanders (1967-1994). Hereford’s Organists included Percy Hull (1918-1950), Meredith Davies (1950-1956) and Roy Massey (1974-2001). Occupants of the post at Worcester included Ivor Atkins (1897-1950), David Willcocks (1950-1957), Christopher Robinson (1963-1975) and Donald Hunt (1975-1996). All of these men were significant musicians – as were those who I’ve not named. It will be noted how long some of these men remained in their posts, giving significant and valuable continuity. Their more recent successors have been equally distinguished musicians. This book successfully chronicles the way that the strong musical leadership at each cathedral since World War II has brought about a much greater widening of the repertoire horizons. I don’t think there can be any dispute that artistic standards have risen, especially in recent years. The authors leave us in no doubt that until comparatively recently rehearsals were limited and pressurised. One particularly dread feature was ‘Black Monday’ when the repertoire for the week was addressed in one mad day of chorus and orchestra rehearsal. An all-too typical Black Monday schedule for 1953 is reproduced on page 234: it makes sobering reading; nothing more than a ‘top and tail’ rehearsal of any work would have been possible. Nowadays things are on a much more professional footing, albeit the demands on the amateur singers of the Festival Chorus remain substantial. The current three cathedral Directors of Music - Geraint Bowen (Hereford), Peter Nardone (Worcester) and Adrian Partington (Gloucester) - are all highly experienced choral trainers and my own experience of attending Three Choirs for the best part of thirty years inclines me to believe that choral standards have probably never been higher than is currently the case. The authors have certainly not produced an anodyne history. Over the three hundred years of the Festival’s existence there have been difficulties along the way, both musical and administrative, and they don’t gloss over these. In particular, readers will be fascinated to learn that far from being a monolithic organisation it’s only in the last decade that Three Choirs has enjoyed the benefits of a unified, professional administration. They will read of the problems that well-meaning but less professional organisation caused at times over the years. The charge of musical conservatism may well have been justified in the past but in the last forty or so years the Festival has provided the launch pad for many substantial new compositions, many of them commissioned by Three Choirs. Composers whose works have been thus showcased include Richard Rodney Bennett, Geoffrey Burgon, Francis Grier, John Joubert, John McCabe, James MacMillan, William Mathias, Paul Patterson, Francis Pott, Torsten Rasch, Malcolm Williamson and many others. The premieres are chronicled in this book and objective comment is made, either by the authors or, more usually, by quotations from contemporary critics. The Festival deserves huge credit for bringing so many new works into the repertoire though to the best of my knowledge only a few of these pieces have established themselves in the repertoire or achieved recordings. It’s no mean achievement for an institution, especially a cultural organisation, to exist and to flourish for 300 years – and counting. 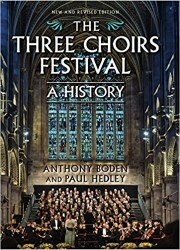 As Messrs Boden and Hedley say, Three Choirs “has outlived all expectations, overcome the vagaries of society, politics and economics, and has shown itself in rude artistic health in recent years.” The story of Three Choirs is a fascinating and remarkable one and it is compellingly related in this book. It’s also entertainingly told. As I said earlier, the authors have an eye for a good quotation; there are also many anecdotes and character sketches which add colour to the narrative. My own favourite concerns the soprano Emma Albani (1847-1930) who was the reigning diva of Three Choirs for 34 years from 1877. As such, she took part in many performances of Elijah. She did not deign, however, to sing the soprano solos in Part I, preferring to save herself for ‘Hear ye, Israel’ at the start of Part II. Apparently, on making her entry onto the platform to perform that aria she would then delay proceedings by kneeling in prayer! So, if you should read of a temperamental singer nowadays, reflect that there’s nothing new under the sun. The book is handsomely produced. The text is clearly laid out and the illustrations, which are very interesting and relevant, are well presented in three blocks. The history has been scrupulously researched and I spotted only two or three minor slips in a text of over 400 pages. The authors’ judgements are perceptive, well-informed and sound though I must take issue with the description of the ‘For the Fallen’ movement of Elgar’s The Spirit of England as “jingoistic”: that description might be justified in respect of the first movement, ‘The Fourth of August’ but not to the other two dignified and deeply-felt movements.